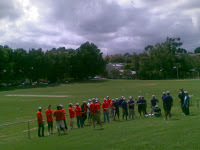 It's that time of the year again for the annual PCo vs. NET cricket match. We've just had our organizational restructure (again), so now it's called the CARE vs. NI cricket challenge. Around noontime, everybody dropped whatever he/she was doing and headed down to Easton Park in Rozelle to get some action (and some free food, too). There were rolls, steaks, chops, sausages, softdrinks, beer, and water for everyone. Players get free T-shirts. While most of the people were concentrating on the match, we got ourselves some shirts, too. Stayed around for a while, then my colleagues and I sneaked off to Clovelly Beach for some afternoon fishing. They did all of the fishing, I took the pictures. After a few hours of fishing, the guys were not too pleased with their catch, and wanted to go to Coogee for more. Me, I've taken my fill of pictures.